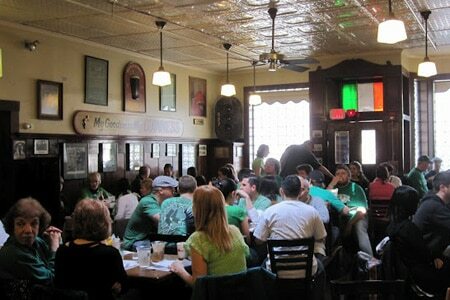 This Hibernian pub has been a favorite of local politicians ever since it opened back in 1882. Breakfast Fri.-Sun., Lunch & Dinner daily, Brunch Sun. : This Jamaica Plain institution has attracted politicians since its opening back in 1882. During their infamous Senate battle, John Kerry and William Weld shared a beer here, as has every major pol for decades on end. And why not? There are more than 20 drafts available on tap and even more by the bottle. The food is run-of-the-mill tavern fare although a few things have been updated for the modern palate. Onion rings are some of the best in town, and a massive platter of nachos topped with cheese, chili, lettuce and salsa is also available. Doyle’s is known for its burgers, which come in the form of beef, turkey, bison and veggie. Entrées range from sautéed scrod with spinach and mushrooms to marinated barbecue steak tips. Satisfy your sweet tooth with bread pudding, strawberry shortcake or Boston cream pie. Expect classic booths, old pictures lining the walls and a regular clientele.